Here you have all manuals of my Curtas in high quality PDF and JPG files. Also you can download from the Download Page. Language: English, Format: PDF, Page size: A4, File size: 5.61 Mb. This manual belongs to my Curta S/N 78223. Rechenbeispiele für die CURTA Rechenmaschine. Language: German/Deutsche, Format: PDF, Page size: A4, File size: 14.9 Mb. This manual belongs to my Curta S/N 59504. Instrucciones para el uso de la Curta. 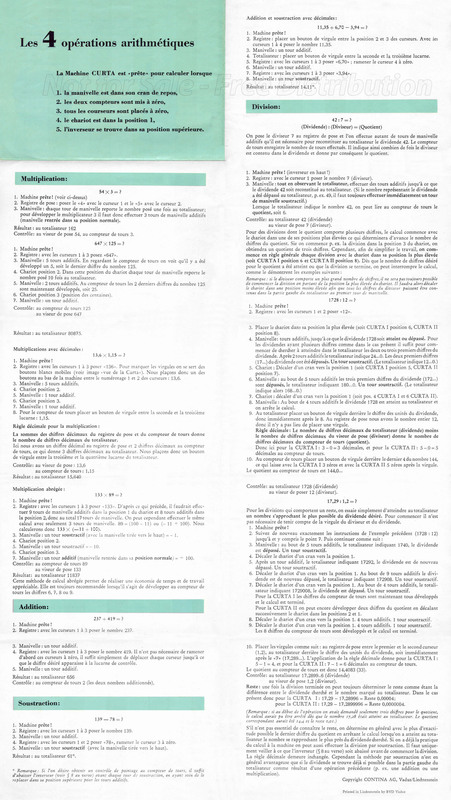 Language: Spanish/Español, Format: PDF, Page size: A4, File size: 5.44 Mb. This manual belongs to my Curta S/N 509872. Language: English, Format: Two JPG images, Resolution: 2500 x 4430, File size: 1.32 Mb and 1.53 Mb. 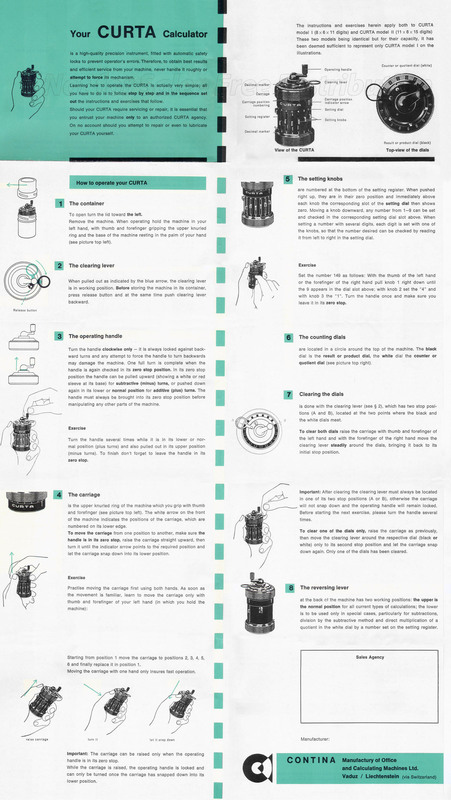 Fold-out instructions for the usage of the Curta. Belongs to my Curta S/N 78223. Mode d'emploi succinet pour la Machine à Calculer CURTA. Language: French/Français, Format: Two JPG images, Resolution: 2500 x 4430, File size: 1.48 Mb and 1.73 Mb. 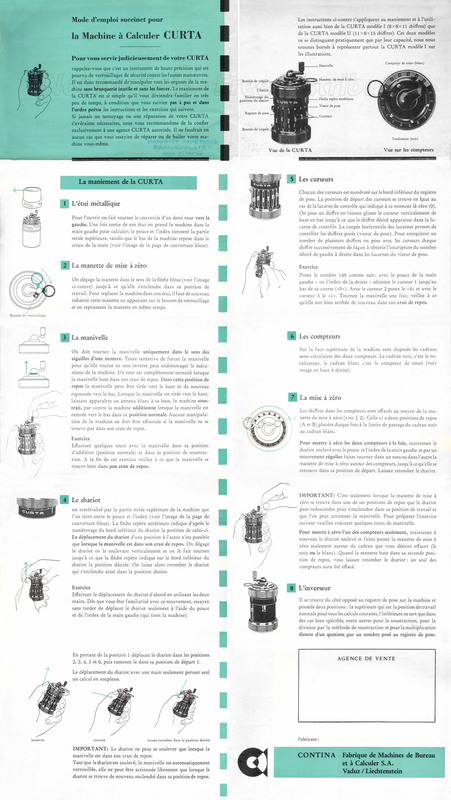 Fold-out instructions for the usage of the Curta. Belongs to my Curta S/N 59504. 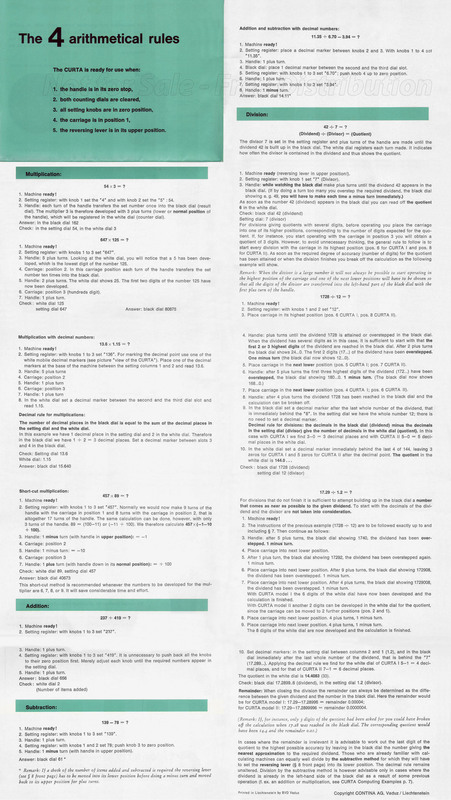 Language: English, Format: PDF, Page size: A4, File size: 5.16 Mb. 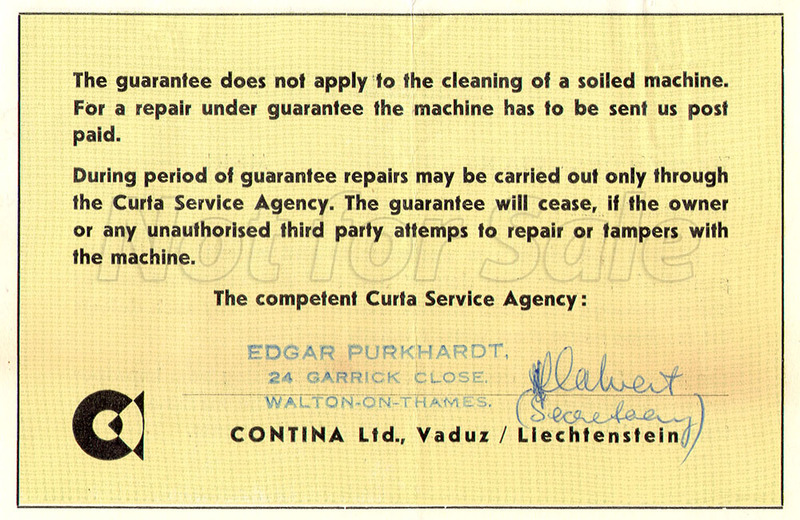 Issued by Automatic Business Machines Limited of London. It shows general techniques of Curta usage as well as specific usage in business, engineering and mathematics fields. It was a gift sent to me with my Curta S/N 558449. Language: English, Format: JPG image, Resolution: 5000 x 1629, File size: 1.53 Mb. This table allows your Curta to make squate roots with a precision of 5 digit quickly. Also this is a gift with my Curta S/N 558449. Language: English, Format: Two JPG images, Resolution: 1000 x 650, File size: 223 Kb and 225 Kb. 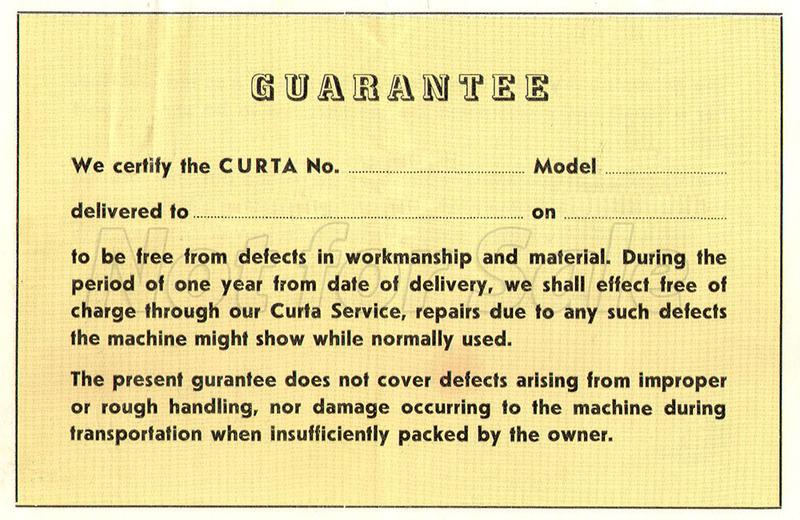 Original Curta Guarantee. Data removed at request of original owner. Belongs to my Curta S/N 509872.